Today marks Equal Pay Day for Asian American and Pacific Islanders (AAPIs). In 2017, median earnings for Asian women in the United States — that is, those who identify themselves as “Asian alone” in the US Census Bureau’s American Community Survey and worked full-time, year-round — were $50,559 per year, compared to median annual earnings of $57,638 made by a white, non-Hispanic men (a difference of about $7,000 per year). Asian women also earned 77 percent of what Asian men earned per year, which is smaller than what all women were paid as a percentage of all men (80 percent). 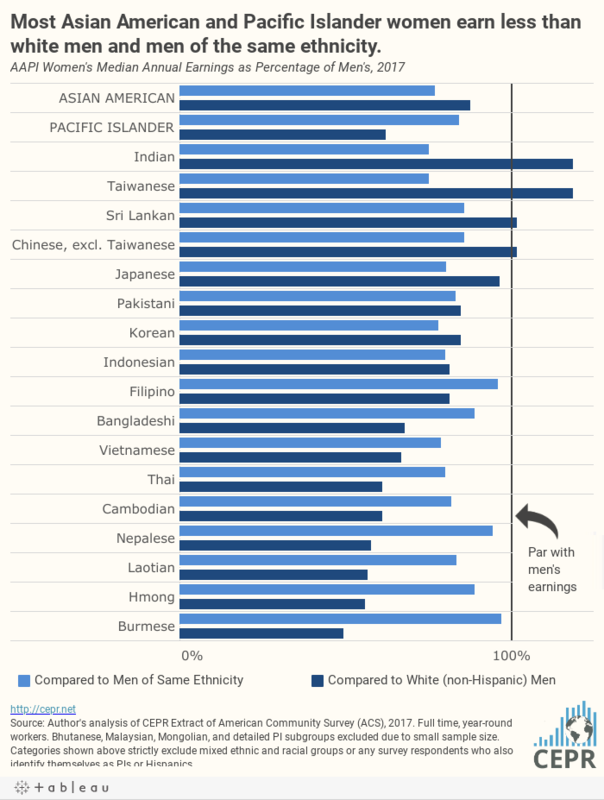 Asian women’s earnings gap, both in comparison to white, non-Hispanic men and to men in the same ethnic groups, varies significantly across different ethnic backgrounds (see figure and table). AAPI workers are highly diverse in terms of nativity, language, geographic distribution, immigration status, and income, among other characteristics, which means that looking across Asian subgroups is important when doing any type of analyses on AAPIs. As can be seen in the figure, even in cases where Asian women had higher median annual earnings in comparison to white, non-Hispanic men (Indian, Taiwanese, Sri Lankan, and Chinese), women made significantly less than men in their ethnic groups. Importantly, across all Asian subgroups, women made less than men in 2017, ranging from 75 percent of men’s earnings (Taiwanese and Indian) to 97 percent of men’s earnings (Burmese). While these earnings calculations do not control for other characteristics of these groups that may influence the earnings, such as geography, immigration status, and English sufficiency, they give us some idea about the variability of earnings between female and male workers across different groups. Such discrepancy is important to understand as a substantial number of AAPI workers face economic insecurities and commentators are often misled by the “model minority” myth. The table below shows that in 2017, 11 percent of AAPIs and 5.5 percent of AAPI workers aged 16 and older lived in a household with income below the federal poverty line (the US Census Bureau’s poverty threshold for a family with two adults and two children was $24,858 in 2017). These rates are higher than whites (9.6 percent of white population and 4.6 percent of white working population) and vary significantly across Asian subgroups, ranging from 5.4 percent for Sri Lankan to 29.2 percent for Burmese. Among Asian workers aged 16 and older, Sri Lankan (2.2 percent), Filipino (2.9 percent), and Japanese (2.8 percent) had the lowest poverty rates, while Nepalese (13.8 percent), Bangladeshi (12.7 percent), and Pakistani (10.4 percent) had the highest poverty rates. The table also shows the gap in poverty rate by gender, for workers aged 16 and older. 5.6 percent of AAPI female workers lived in a household with income below the federal poverty line, while 3.8 percent of white, non-Hispanic male workers lived in a household with income below poverty. The set of popular assumptions that define AAPIs as wealthy and economically secure are misleading. 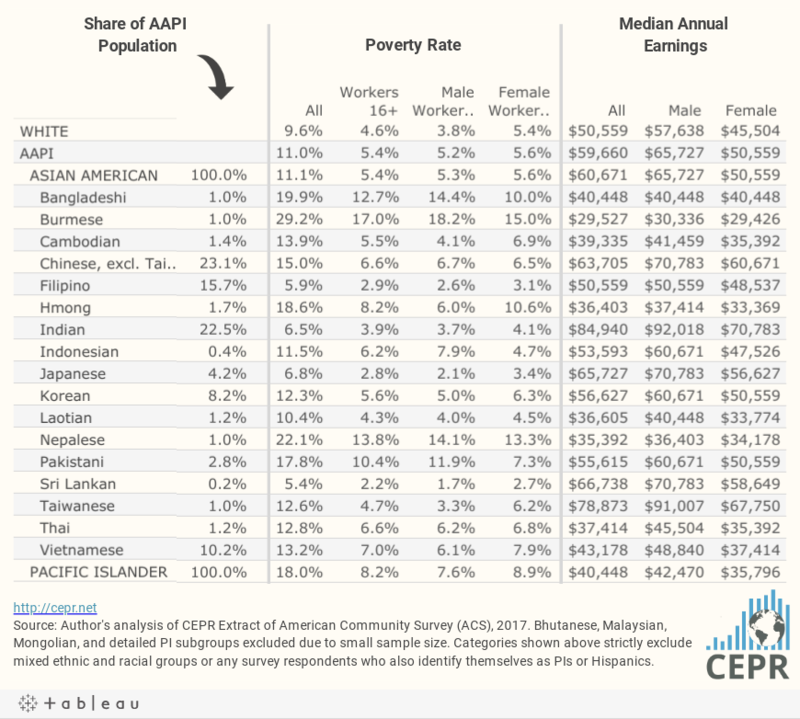 While there are AAPI women in some ethnic groups that make more than white, non-Hispanic women, such as Indians, Taiwanese, and Chinese, many other subgroups make significantly less and are in extreme poverty. Additionally, many AAPI workers face high unemployment rates, struggle with language difficulties, and experience inequality within their own ethnic groups. It would be important to understand these challenges facing AAPI women as researchers and policy advocates continue to work towards equal pay for all.